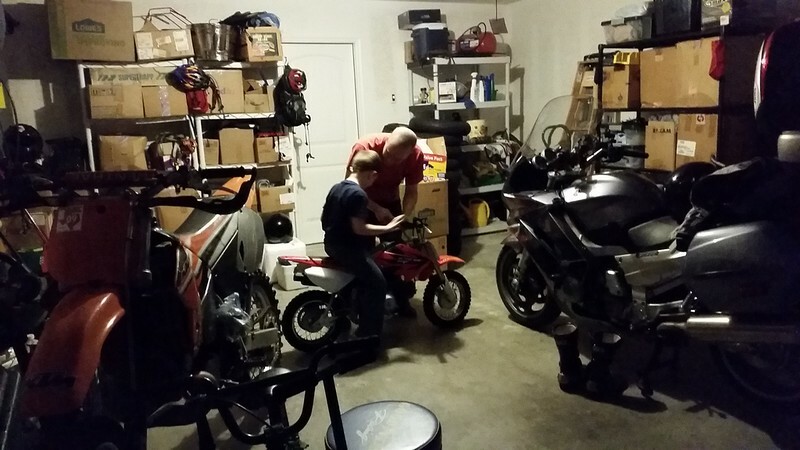 Jakob turned seven this year and it was time to get him introduced to motorcycling to see if he likes it. 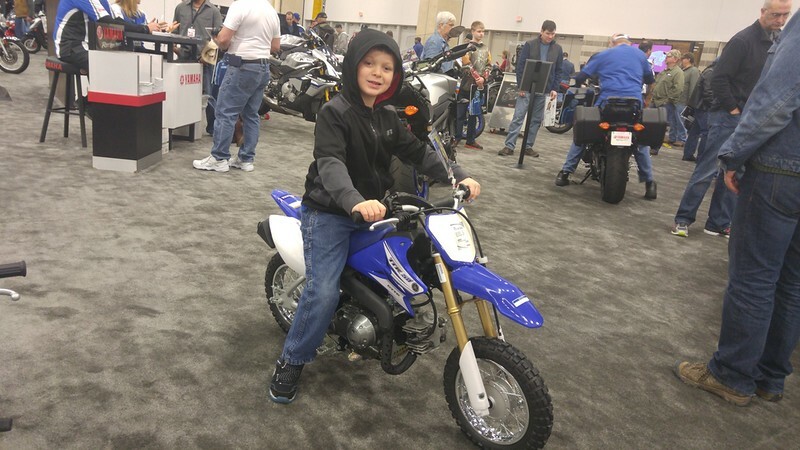 We started off in January by going to the motorcycle show as we usually do, but with the intention of letting him sit on bikes to see what would fit him. 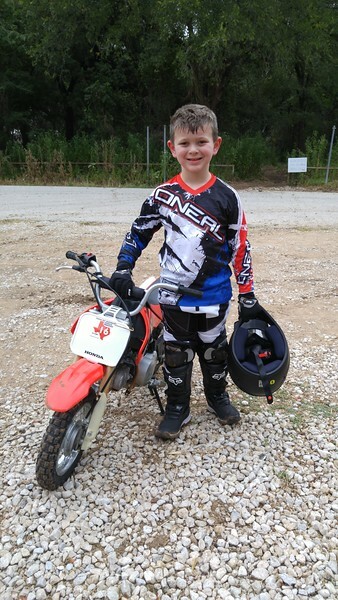 Seems he's at an awkward dirt biking stage. 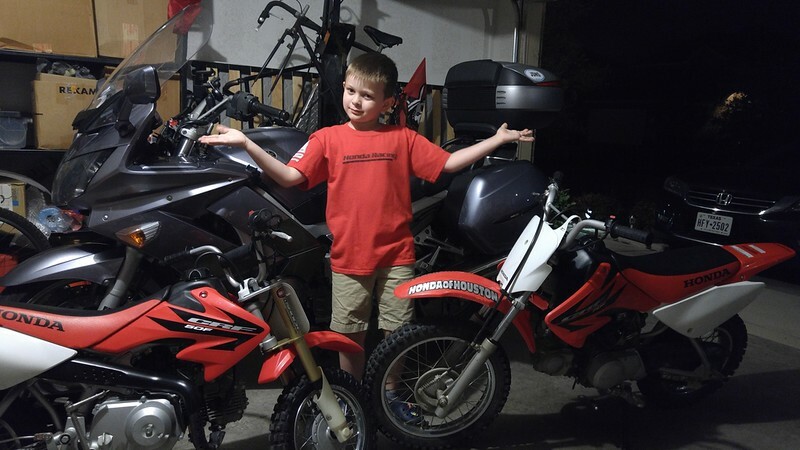 Most of the 50's are a little too small for him, but he's not big enough to move up to the bigger bikes like the 65's with the exception of the DRZ70, which seemed like a good fit. Yamaha, not a bad fit. 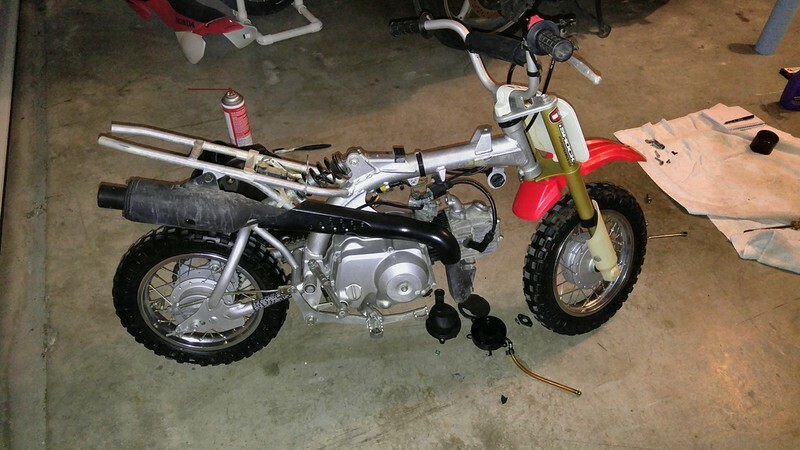 KTM 65 is too big. Honda CRF50F is pretty good. 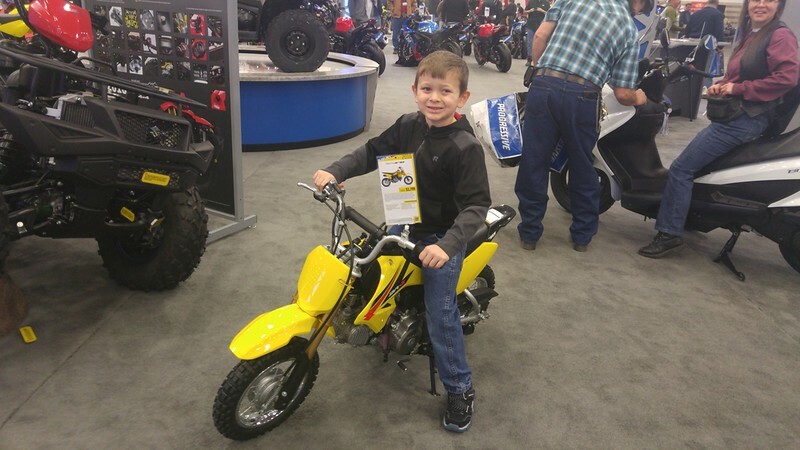 Suzuki DRZ70 is really good, but I worry about the bigger motor, and they aren't easy to find. 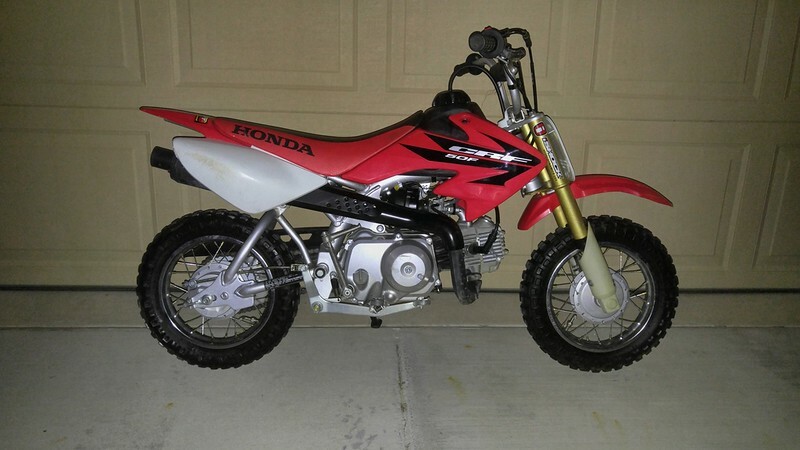 Ultimately, I found a Honda CRF50F in really good condition for a good price locally. MJ and I went and picked it up and then proceeded to hide it in the garage until his birthday. 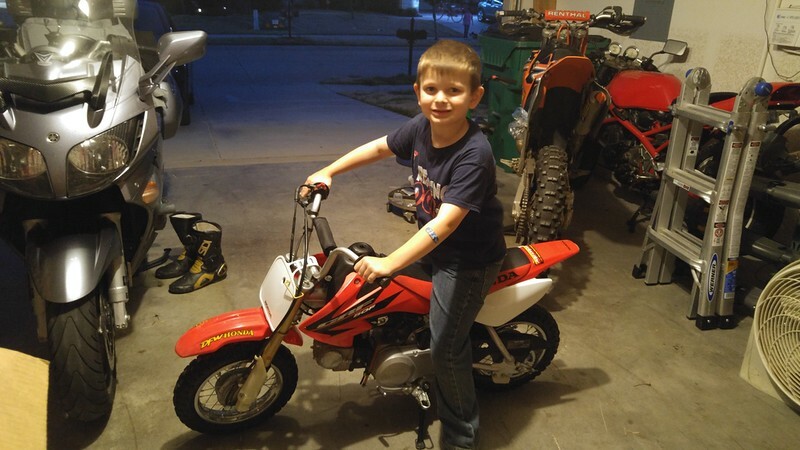 Here he is with his first ever motorcycle. MJ snapped this picture of us going over the various controls and me answering all his questions. Then it was time to get him some gear. We went to Cycle Gear to just get him a helmet and boots. Mom went a little crazy. At least he looks good standing still. Alas, pretty though she may be, a ten year old bike does need a little work done on it. Wasn't long till I was getting to know the bike and finding a few items that needed attention. The carb got a good cleaning. The air filter was junk. 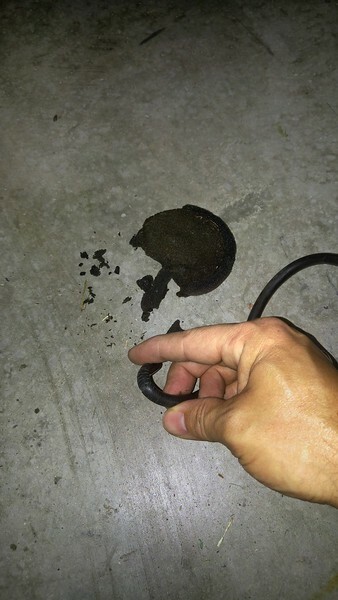 And I found the culprit of the fueling issues, a dry rotted fuel line that was sucking a lot of air. I put in an order online for all of those parts and a few other fasteners and things that needed replacing. Parts that need to be replaced. Wasn't long till it was running pretty good and looking very pretty at the same time. While all of this was going on, we were also waiting on some decent weather to let us get him out to play. The best closest riding area was still under water from the overflowing nearby lake from all the rain we've had the last year and a half. In the mean time, a deal came along on a CRF70 that I couldn't pass up. 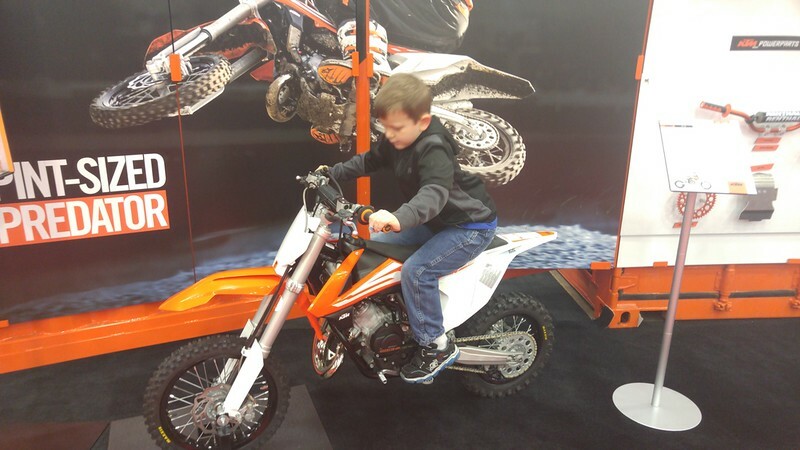 This would be the ideal bike to move him up to next, and could let me chase him around on it in the meantime. It was maintained by a friend of mine and mechanically was in a ready to ride condition, much better than the 50 had been. I drove halfway to Houston to meet up with him and bring it home. What's a spoiled kid to do? He's been out riding several times now and after starting off with a bad crash that had him wanting to quit, I made him go back out again and he was ok. Now he is really starting to really love it and is asking me always when we can go out again. I think I've got him hooked. Sweaty after a hard day riding in the Texas heat and some abnormally high humidity. Paired up with some new tubes. This really helped him out especially since things have been quite dry lately and the sand was very loose. 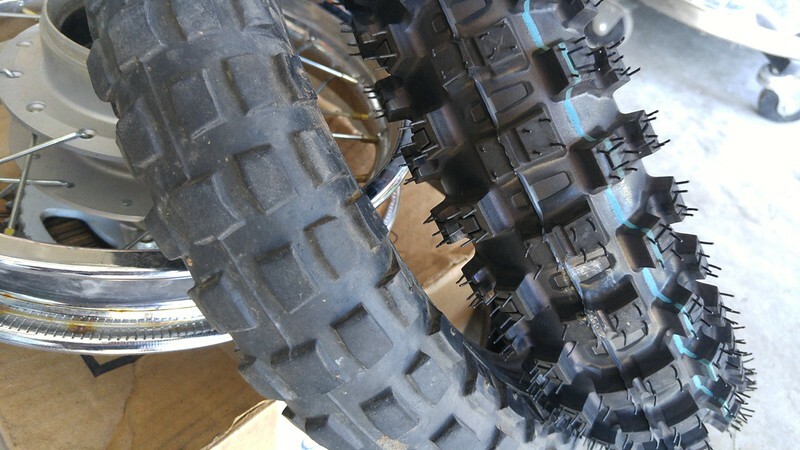 Final image of this post, the old tires with the new. A couple of videos of him learning to ride.